The EU ‘sleepwalked’ into the Ukrainian crisis after a failure to address Moscow’s concerns over Western policies, a UK parliamentary report says. Europeans suffer from poor analytic capacity when it comes to Russia. The scathing report on the causes and the future of the Ukrainian debacle and Russia-West divide was prepared by the House of Lords, European Union Committee tasked with considering UK’s participation in EU matters. The report identified policies in both Russia and EU and its member states that prevented them from engaging in dialogue and building trust between each other. Europeans are particularly guilty of lacking analytical capacity to properly understand Russia and predict its responses to EU’s actions. 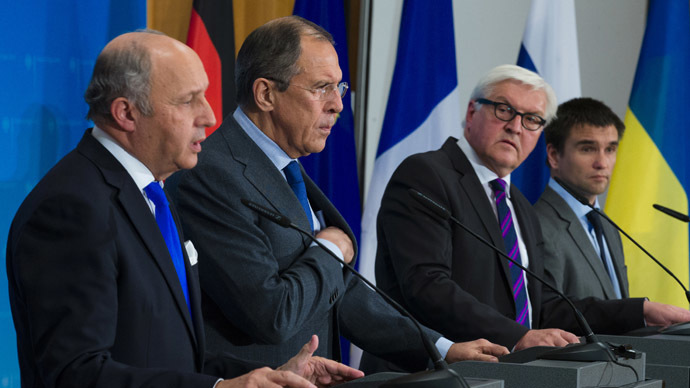 “There has been a decline in Member States’ analytical capacity on Russia. This has weakened their ability to read the political shifts and to offer an authoritative response. Member States need to rebuild their former skills,” the report said. “There is also a reduced emphasis on the importance and role of analytical expertise in the FCO (Foreign and Commonwealth Office, UK’s Foreign Ministry). The FCO should review how such skills could be renewed and how analysis can feed into decision-making processes,” the report added. The Lords say Western policies towards Russia didn’t acknowledge the genuine concern about the enlargement of NATO. “For the Russians NATO is seen as a hostile military threat, and successive rounds of NATO’s eastern enlargement have, as the Russians see it, brought it threateningly close to the Russian border. EU enlargement, as it has become conflated with NATO enlargement, has also taken on the aspect of a security threat,” the document said. “Russian security threat perceptions of NATO have to be acknowledged, and also challenged, in any discussions on European security,” the report recommended. Russians see the eastwards enlargement of the EU as a process parallel with NATO expansion, the report points out. So the European drive to get Ukraine into the Eastern Partnership program was viewed as not only an attack on Russian economic interests in Ukraine, but also on its national security. The quick move towards renouncing Ukraine’s military non-alliance status by the new authorities in Kiev, which took power from President Yanukovich in February 2014, strengthened this assessment. Economically there was also lack of proper communication between the EU and Moscow in the run-up to the Ukrainian crisis, the report said. The events in Ukraine were triggered by the EU Association Agreement, a free-trade treaty that Brussels wanted Kiev to sign and which the former Yanukovich government chose to postpone. Russia opposed the deal, saying it would hurt its trade with Ukraine and damage the latter’s economy. “Collectively, the EU overestimated the intention of the Ukrainian leadership to sign an Association Agreement, appeared unaware of the public mood in Ukraine and, above all, underestimated the depth of Russian hostility towards the Association Agreement,” the report said, adding that Europeans “did not connect the dots” in this case. The pursuit of the agreement with Ukraine and the entire Eastern Partnership program, which is aimed in integrating Russia’s neighbors closer with the EU are causing turmoil, and the EU is partly to blame, the report suggests. The British Lords acknowledge that “Moscow has a right not to be excluded from the eastern neighborhood” and recommended that the EU engaged “in a fundamental reassessment of their strategic interests” there. The report approved EU’s sanction policy towards Russia over the Ukrainian crisis, but says a proper long-term exit strategy is needed. “There is no evidence that sanctions have caused [Russian] President Putin to shift his stance on Crimea, where Russia has direct and vital security interests through the Sevastopol naval base,” the document states. The report suggests that resolving the legal status of Crimea should be postponed until more urgent matters of stopping the violence in Ukraine and helping its ailing economy are addressed.